Very colourful, I brought one for my wife in St Petersburg many years ago. I bet it was much appreciated, Mark. I’m a charm bracelet fan, and of course had to get a little silver matrioshka for my bracelet to represent Russia following our visit to St. Petersburg. Did you make it to Peterhof? As normal with me It was a working visit, so not much time, did manage to visit the Hermitage Museum which was nice. Sounds like your schedule was short like ours. We only had time to explore a bit of the downtown and to see Peterhof. I imagine that the Hermitage must have been extraordinary? So cool! They look hand painted. Travelagos, I think they are hand-painted. I’ve heard that squirrel-hair brushes are sometimes used to paint the delicate swirls on traditional Russian pins and nesting dolls. I agree that they’re delightful, Virginia. When we were in St. Petersburg, Russia last summer, I was delighted to see a cement truck’s twirling drum painted like a matrioshka! Alas, we were stuck in traffic and I couldn’t get a good snap. So pretty! 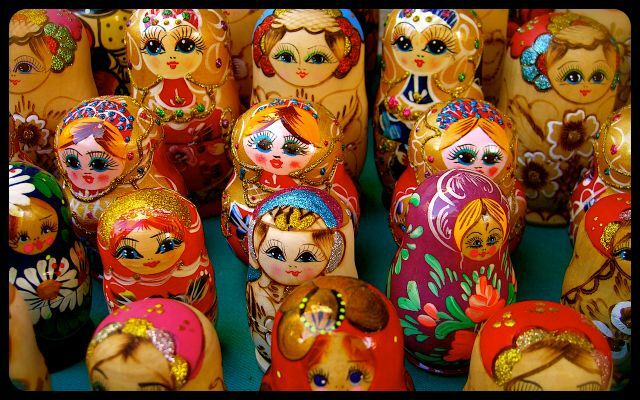 Going to the stalls and buying a matryoshka is never easy – they are all so lovely! Did you buy one Tricia? Marina, I didn’t buy one in Mostar, but two of the sets I have go back to my childhood (and have the USSR paper labels pasted on their bottoms). It’s funny to see how the designs have really evolved – from more traditional designs to modern concepts. In St. Petersburg, we saw politicians’ and sports stars’ faces emblazoned on the figures. One in Prague depicting President Clinton had an entire cast of female characters as nesting dolls, leading up to a tiny saxophone doll. Yes, my mum has some beautifully painted dolls and they may be mass produced these days, but you can find some good ones. My sisters and I each have a beautiful matryoshka doll. I bought a Pittsburgh Steelers matryoshka doll for my pen pal in… Pittsburgh! he loved it! Now that’s one we haven’t come across on our travels – how fun! It seems they’ve found a way to cater to every market. Lovely matrjoshki. Here in Ukraine, we also have them. It seems as if the little dolls have migrated everywhere, Mirjam. Also, as a result of your nice comment, I’ve learned the proper plural for the word. :-) Thank you for commenting! I have a set with Boris Yeltsin and Gorbachev. They can get pretty creative with their matryoshki in Russa! Glad they brightened your day, Jar of Salt! Do you have any matrioshki? Actually, yes! We only have one, given as a present a long, long time ago. Love the rich red and violet hues :).